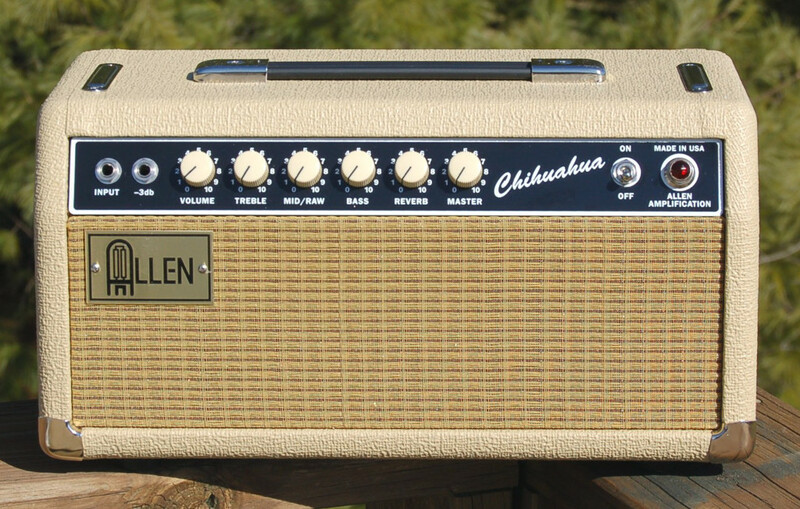 The Allen Chihuahua ("chi-wah-wah") takes the home practice amp up to a whole new level. A Class A single-ended tube amp using a single 6L6 or EL34 power tube for 10 watts to drive a 10" Copperhead speaker with a full tone stack including my RAW mid/gain boost control and all tube driven spring reverb! 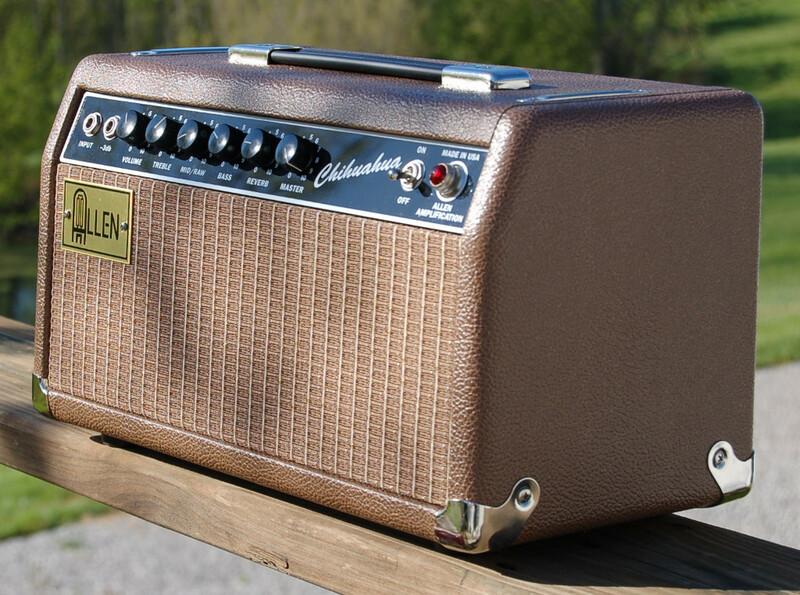 The reverb recovery has an extra gain stage which is very welcome for great overdriven tones. The RAW control unscoops the mids for a more 5F1 tweed type tone. 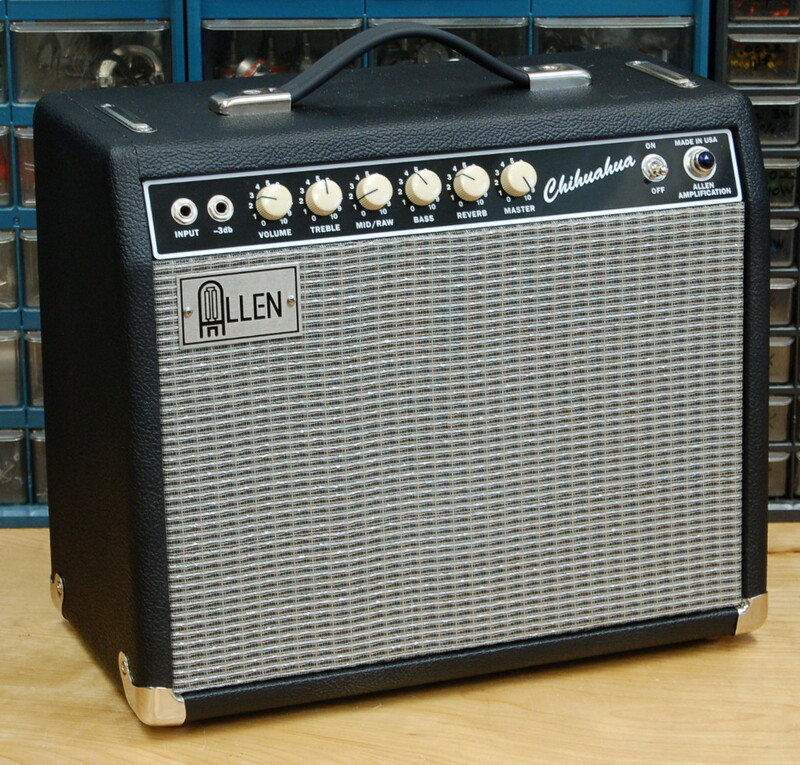 It has a respectable amount of clean headroom and bottom end authority on bass notes for an amp this size/power. 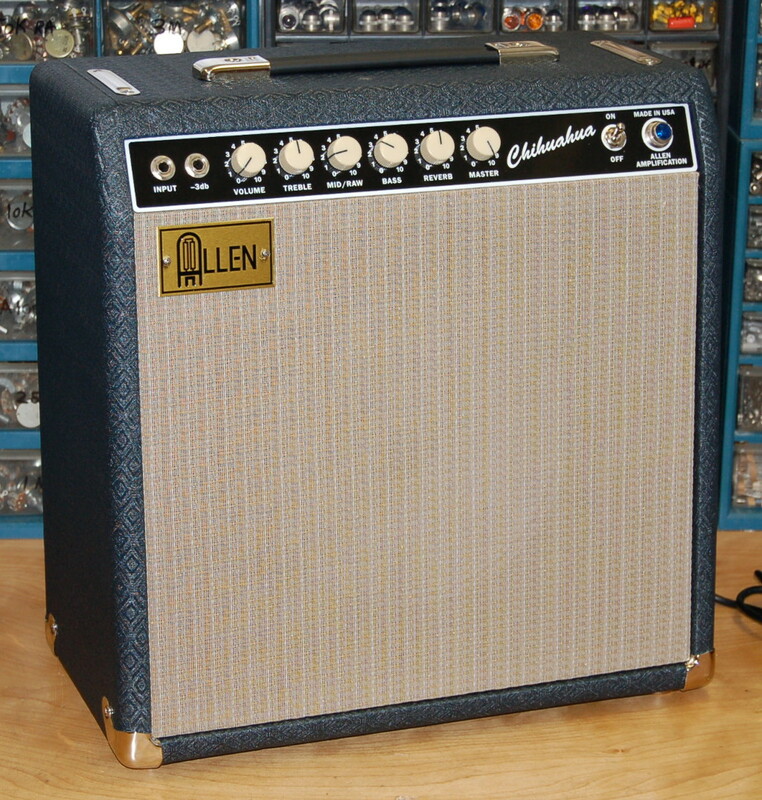 At only 17" by 17" and 24lbs it is the perfect grab n' go practice amp. I've added an additional filtering stage to get rid of the typical "single-ended background hum" normally produced by these little amps so it is great for recording, too! 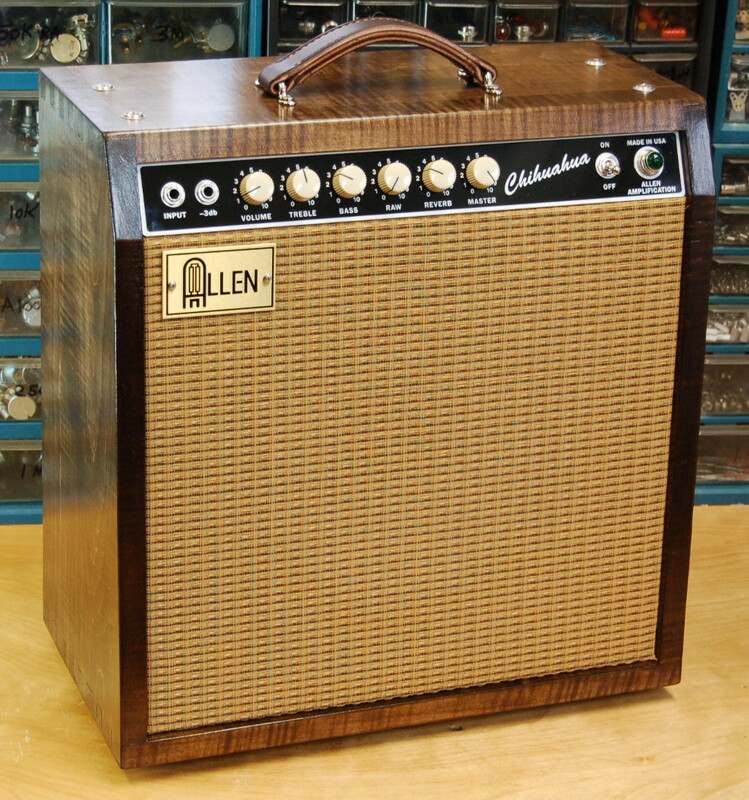 All top notch components throughout including a stainless-steel chassis, US made power transformer, Heyboer output transformer, Accutronics 9" reverb tank, Switchcraft jacks, Carling switch, Mallory M150 tone capacitors, etc. Also available as a head and in kit form. 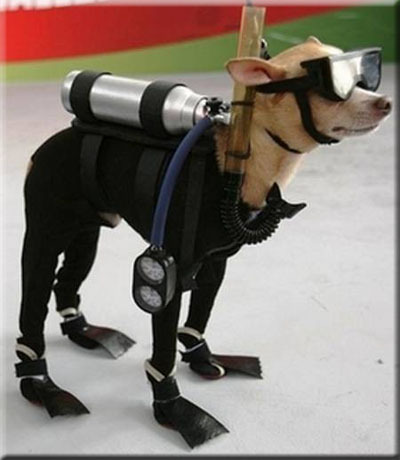 The Chihuahua KIT now features simplified step by step assembly instructions! 10 watts with an 8 ohm speaker load. 1 6L6 or EL34 power tube, 2 12AX7 and 1 12AT7 preamp tube. Treble, Bass, and foot switchable RAW control. TP24 power transformer is made in Chicago. TO11C Heyboer paper stick wound interleaved output transformer. See the TRANSFORMERS page for details. Loosely based on the blackface Champ with AB763ish reverb added. Beefed up transformer set and power supply for use with 6L6/EL34 power tube and addition of MID/RAW control. Master volume control. Finger-jointed pine cabinet with Birch plywood baffle and MDF back panels that don't warp. Reinforced black strap handle, bottom chrome corners and chassis straps. WGS G8C for the 1x8, Eminence Copperhead for the 1x10, and Eminence Red, White and Blues for the 1x12. Dual input jacks (normal and -3db), master volume control, tube driven spring reverb using the 9" Accutronics tank, extra gain stage for better overdriven tones and a MID/RAW control to go from blackface scooped mids to thicker 5F1 tweed type tone. Foot switchable RAW control. Now with an extension speaker jack! 1x8 combo - 17"W x 14"H x 9"D, 21lbs. 1x10 Combo - 17"W x 17"H x 9"D, 24 lbs. 1x12 combo 20"W x 18"H x 9"D, 30lbs. Head - 17"W x 8-1/2"H x 8-1/2"D, 19 lbs. Chihuahua 1x10 amp was used for the clips blow. 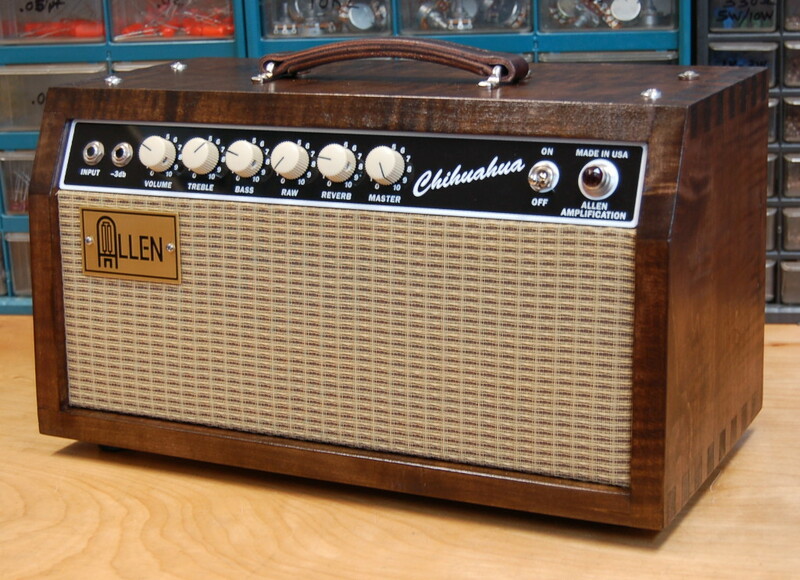 Clips provided by The Sound LLC in Charlottesville, VA.
Tony Sims checks out the Allen Chihuahua 10W 1x10 amp. Tony Sims with the Allen Chihauhua 1x10.